To put it in perspective, Jane’s Party started entirely in a garage – they even named their first album The Garage Sessions. In the decade since then, they’ve gone from stripped down acoustic to full-on genre-bending sounds. They credit fellow Canadians bands Zeus, The Golden Dogs and Arkells as their main influencers as they played the same scene in Toronto. They even got to record their second album, Hot Noise, at Zeus’ studio. They ended up getting tied in with a guy named Devin Cuddy, whose father Jim plays in Canadian country rock band Blue Rodeo. Their third album, Tunnel Visions, was recorded with fellow Blue Rodeo member Greg Keelor at his Lost Cause Studios. With this album, they began to delve into modern style textures and sounds – trying things they hadn’t tried before. 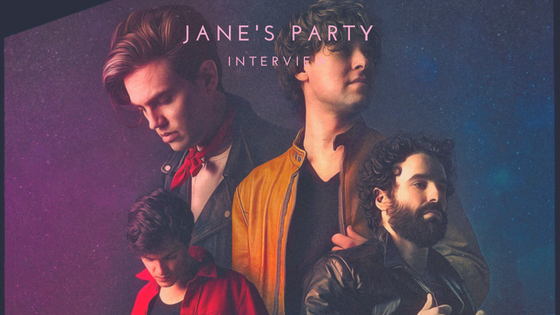 Their latest singles, “You’re the Light” and “Right Down the Line” spotlight some of their best work and capture the interwoven sounds that makes them Jane’s Party. “You’re the Light” was collectively written by Sutton, Jeff Giles, Devon Richardson and Tom Ionescu. They began by throwing around verse ideas; having a pre-chorus going but never really figuring out a chorus section. Once the song came together, they noticed a bit of repetition throughout the lyrics. That’s when they called in Fast Romantics lead singer Matthew Angus. “Right Down the Line” is a Gerry Rafferty cover that they originally recorded in their home studio. After each member laid down different pieces of the track, they sent a rough cut to DJ and record producer Skratch Bastid who became featured on the track. Jane’s Party has come a long way since starting in a garage. With a new album anticipated in the fall, it’s just a matter of time before their genre-bending sounds continue to dazzle their audience.